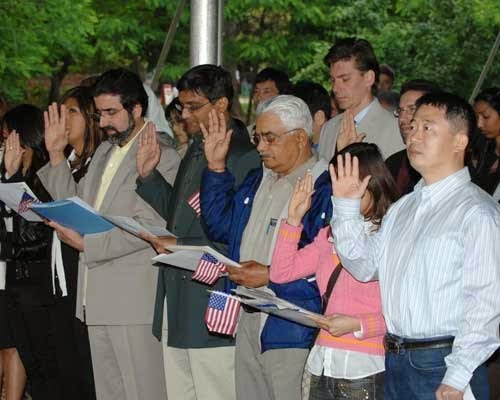 a naturalization ceremony in Portland, Oregon. "I hereby declare, on oath, that I absolutely and entirely renounce and abjure all allegiance and fidelity to any foreign prince, potentate, state, or sovereignty of whom or which I have heretofore been a subject or citizen; that I will support and defend the Constitution and laws of the United States of America against all enemies, foreign and domestic; that I will bear true faith and allegiance to the same; that I will bear arms on behalf of the United States when required by the law; that I will perform noncombatant service in the Armed Forces of the United States when required by the law; that I will perform work of national importance under civilian direction when required by the law; and that I take this obligation freely without any mental reservation or purpose of evasion; so help me God." I have often wondered how many us born in the USA would say those words. I would - how about you? If you live in another country would you say the oath for your country? Last year or the year before they took a poll in Japan about whether or not people were willing to fight for their country (including in the event that another country was invading). 70% or so of the population said, "No." It is always a great thing to see. Many of us wouldn't even be able to pass the citizensip test.